Class III malocclusion is a challenging orthodontic problem. 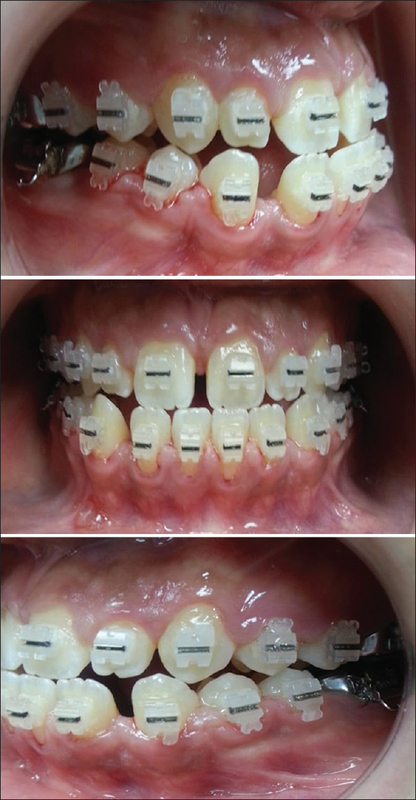 A good understanding of the age, amount, and direction of growth in Class III patients comes into play when deciding between orthodontic and surgical approaches to the malocclusion. The treatment of Class III malocclusion poses one of the biggest problems for the orthodontist, due to mandibular growth. Studies on facial growth demonstrate that the maxillary growth ends before that of the mandible.,, Thus, Class III discrepancy worsens with age., Angle's Class III malocclusion is one of the malocclusion which shows malrelationship of both the upper and lower jaws in sagittal plane with either maxilla arrested in its sagittal or vertical plane with mandible being prognathic and showing forward rotation or prognathism. An anterior crossbite not only significantly affects facial esthetics and the function of the stomatognathic system but also has a tendency to worsen with age. The etiology of Class III malocclusion is multifactorial because of the involvement of genetics, ethnicity, environmental factors, and habitual postures. The recommended age for the treatment of an anterior crossbite is 8–9 years. If adult patients miss the early chance to receive orthodontic treatment, orthognathic surgery or dental camouflage is possible later treatment options. Conventionally, orthognathic management requires pre- and post-surgical orthodontic treatment which increases the costs while the surgery places patients at an anesthetic and a morbidity risk. The majority of patients are unwilling to accept this treatment. Orthodontic camouflage is a therapeutic process that masks the skeletal discrepancies instead of correcting them. Therefore, dentoalveolar compensation is made without correcting the basal dysplasia. Camouflage would be justified and simplified if it was feasible to improve maxillomandibular relations to compensate for a deficient maxilla. Camouflage also implies that the tooth repositioning will have a favorable effect or at least be less damaging to the facial esthetics. However, we sometimes treat patients with severe problems who do not want surgery as a part of the treatment plans. Early treatment of Class III malocclusion offers a lot of benefit to the patient as the need of the treatment in the permanent dentition will be reduced as the options would be limited to camouflage or surgery. In cases treated by orthodontic camouflage, the dental movements are often the opposite of those necessary before surgery, where dentoalveolar decompensation is the objective. Orthodontic camouflage treatment should be prescribed for young adults only if, before treatment begins, there are cephalometric indications that residual growth will not provoke a worsening of the deformity after treatment, causing dentofacial asymmetry. Camouflage also implies that the tooth repositioning will have a favorable effect or at least be less damaging to the facial esthetics. 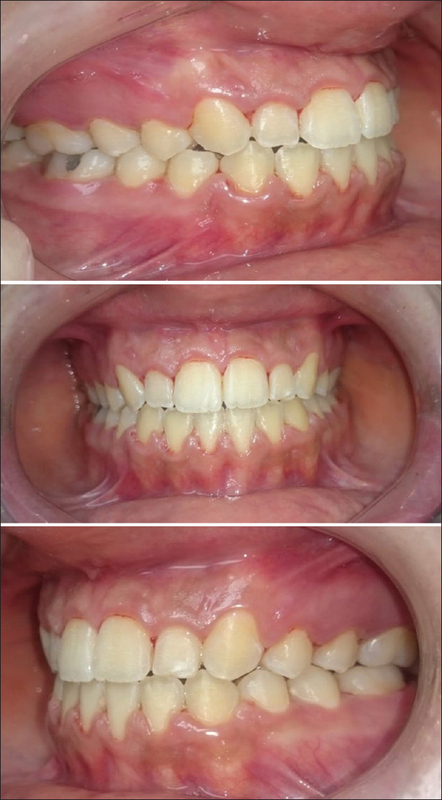 Here, we report a nonsurgical treatment approach and its outcome for a young adult patient with a skeletal and dental Class III malocclusion. A female patient of 19.6-year-old was reported with a chief complaint of spacing in between her upper and lower teeth, forwardly placed lower anterior teeth and poor facial appearance. On intraoral examination, it was revealed that she already had fixed preadjusted appliance on her both maxillary and mandibular teeth for the past 1 month. She had generalized spacing in between maxillary and mandibular anterior teeth, high upper labial frenum, upper incisors were retroclined, lower incisors were proclined, forward path of closure. A full cusp Class III molar and canine relation [Figure 1]. The incisors were in crossbite extended from canine on the right side to the left side with reverse overjet of 3 mm and a reverse overbite of 2 mm. Her upper dental midline was shifted to the right side and lower midline to the left side in relation to facial midline. She had high labial frenum in maxillary arch. On extraoral examination, her profile was found to be concave with flat midface and prominent appearance of lower lip and chin. An acute nasolabial angle and an avarage mentolabial sulcus. The smile was unesthetic as there was a generalized spacing and the maxillary teeth were retroclined and mandibular proclined with more exposure of mandibular teeth [Figure 2]. On cephalometric analysis, SNA-87°, SNB-88°, AO-BO 10 mm, FMA-25°, U1-NA 9°, 27 mm, U1-A Pog 32° 11 mm, U1-N-Pog 14 mm, L1-NB 35°, IMPA 92°, L1-A Pog 30°, 12 mm, L1-N Pog 14 mm, and U1-L1 120° 0 mm suggesting Class III skeletal malocclusion with prognathic maxilla and mandible in relation to cranium and prognathic mandible in relation to maxilla. She had a horizontal growth pattern and CVMI between 4 and 5 stages [Figure 3]. Although clinical data, radiographs, and dental models verified that the patient presented Class III malocclusion with anterior crossbite, with prognathic mandibular in relation with maxilla and horizontal skeletal pattern, she was conscious of her facial appearance, but she was not concerned about the mandibular prognathism. She did, however, want to diminish the concavity of her midface. Treatment objectives included correction of anterior crossbite, closure of upper and lower anterior spaces, correction of Class III molar and canine relationship, correction of midline discrepancy, improvement of facial profile, and establishment of a stable occlusion. Stable results in skeletal Class III malocclusion with prognathic mandible can be obtained with orthognathic surgery procedure like bilateral sagittal split osteotomy (BSSO). In this case, BSSO procedure was the treatment option. Since the patient profile was good and she was not willing for surgery, nonextraction orthodontic camouflage treatment was executed. She was informed about late mandibular growth and need of surgery if required. 018” MBT ceramic with metal slot brackets were bonded on the upper and lower arches with bilateral fixed posterior bite plane with light-cure flowable composite on the lower molar. Leveling and alignment were started with 14, 16 nickel titanium (NiTi) followed by 16 stainless steel (SS) and sequence of 16 × 22 NiTi archwires in the upper and lower arches. Three months after leveling and alignment, frictionless mechanics was started in the lower arch with T-Loops in 16 × 22 TMA wire, gable bends were incorporated with alpha 10° and beta 35°, 3 mm of sagittal activation was done every month till Class I incisor relation was achieved. In maxillary arch, 16 × 22 SS wire and echain from 12 to 22 were given along with 2.5 oz, 4.2 mm Class III elastics. Four months later, the upper and lower anterior spaces were closed and lower crossbite was corrected. Both the arch wires were changed to 16 × 22 SS and echains were given from 17 to 27, 37–47. Class III elastics were continued for the next 1 month which was later changed to cross elastics to correct dental midlines for the next 2 months. The settling of occlusion was done with 17 × 25 TMA wire in both the arches and vertical settling elastics were given in posterior teeth for the next 2 months. Frenectomy was performed 10 days before debonding. 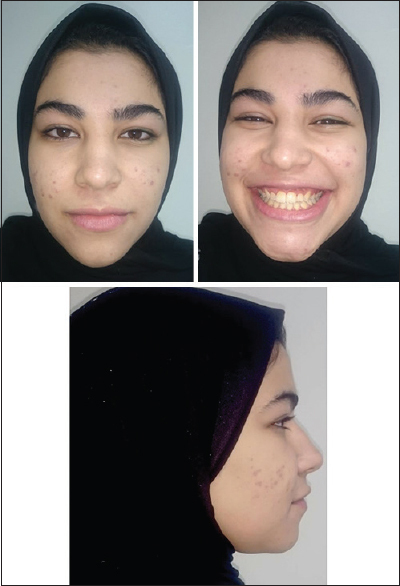 The posttreatment changes in the extraoral appearance were remarkable with improvement in the overall facial appearance and change in the facial profile from concave to mild convex [Figure 4]. 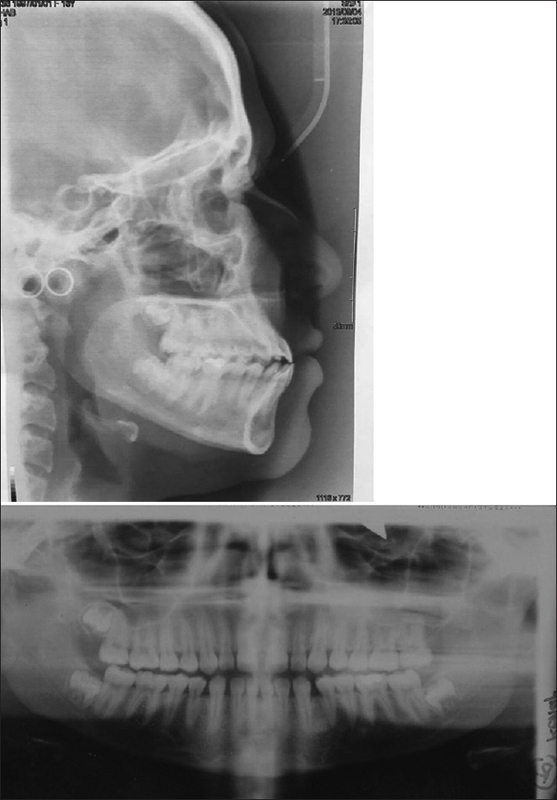 An esthetically acceptable smile arc was achieved after the correction of the anterior crossbite, normal overjet and overbite, and a stable occlusion with good intercuspation [Figure 5]. Following the treatment, functional occlusion was obtained with anterior guide and lateral and protrusion movements, with satisfactory Class I canines and molars relationship. Maxillary and mandibular midlines were coinciding with facial midline. The total treatment time from starting until removal of orthodontic appliance was 1 year. Fixed/bonded retainer was given from premolar to premolar along with removable Hawley's retainer (labial bow soldered to adams) in both maxillary and mandibular arches. The occurrence of Class III malocclusion is believed to be hereditary although environmental factors, such as habits and mouth breathing, may play a role. Individuals with Class III malocclusion may have a combination of skeletal and dentoalveolar components. The strategy for treating borderline orthodontic Class III cases with camouflage therapy is to create dentoalveolar changes that will compensate for a skeletal base imbalance. The decision as to which type of treatment is indicated is usually based on the degree of the anteroposterior and vertical skeletal discrepancy, the inclination and position of the incisors, and the dentofacial appearance. Orthodontic camouflage is a viable alternative for the treatment of the mild-to-moderate skeletal discrepancies of the maxillary structures with the aim of correcting the occlusal relationships in patients who for different reasons, decide not to be treated surgically. An ideal candidate for the camouflage treatment should present little residual growth potential, and mild-to-moderate spacing thus allowing for the achievement of the orthodontic camouflage and improving the dentoskeletal relationships. The case described here is a skeletal and dental Class III patient with concave facial profile and spacing in the upper and lower anterior teeth and anterior crossbite. Therefore, alignment and leveling and the upper and lower incisor correction could be concurrently achieved. As a result, oral function and dentofacial esthetics rapidly improved while surgical risks were avoided. The occlusal pads raised the bite and eliminated upper anterior tooth interference was vital for retraction of the lower anterior teeth. During treatment, the labial and lingual inclinations of the incisors altered and the lower molars relation was changed to Class I with the use of early light Class III elastics and frictionless mechanics. 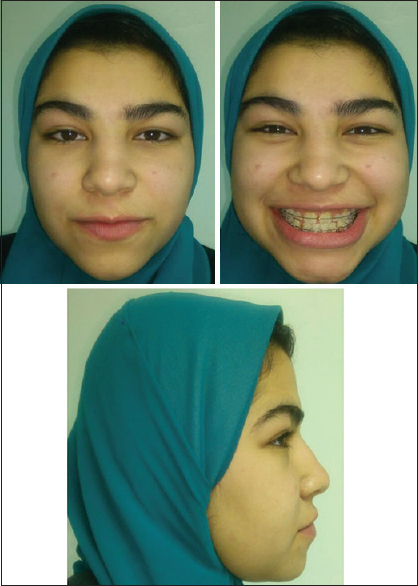 The patient was asked to wear the elastics 24 h a day and changed every alternate day. Existing spaces helped the incisor and molar relation to change into Class I without extracting any teeth. Nonsurgical, nonextraction treatment of a Class III young female patient was reported. The basis for this treatment approach was presented, and the final treatment result was obtained. The proposed treatment objectives were to obtain a stable dental articulation and good esthetics instead of the skeletal disharmony, and dental Class III malocclusion was achieved. Baccetti T, Reyes BC, McNamara JA Jr. Craniofacial changes in Class III malocclusion as related to skeletal and dental maturation. Am J Orthod Dentofacial Orthop 2007;132:171-8.e4. Turley PK. Orthopedic correction of class III malocclusion with palatal expansion and custom protraction headgear. J Clin Orthod 1988;22:314-25. Martins DR, Janson G, Almeida RR, Pinzan A, Henriques JF, Freitas MR. Atlas de Crescimento Craniofacial. Säo Paulo: Santos; 1998. Kambara T. Dentofacial changes produced by extraoral forward force in the macaca irus. Am J Orthod 1977;71:249-77. Irie M, Nakamura S. Orthopedic approach to severe skeletal Class III malocclusion. Am J Orthod 1975;67:377-92. Casko JS, Shepherd WB. Dental and skeletal variation within the range of normal. Angle Orthod 1984;54:5-17. Cozzani G. Extraoral traction and Class III treatment. Am J Orthod 1981;80:638-50. Proffit WR. A Textbook of Contemporary Orthodontics. 4th ed. St. Louis: Mosby; 2007. p. 689-707. Huang JF. Early anterior crossbite: A developmental problem required to be resolved. Chin J Orthod 2002;9:145-50. Hisano M, Chung CR, Soma K. Nonsurgical correction of skeletal class III malocclusion with lateral shift in an adult. Am J Orthod Dentofacial Orthop 2007;131:797-804. Costa Pinho TM, Ustrell Torrent JM, Correia Pinto JG. Orthodontic camouflage in the case of a skeletal class III malocclusion. World J Orthod 2004;5:213-23. Battagel JM. The aetiological factors in class III malocclusion. Eur J Orthod 1993;15:347-70. Lin J, Gu Y. Preliminary investigation of nonsurgical treatment of severe skeletal class III malocclusion in the permanent dentition. Angle Orthod 2003;73:401-10. Graber TM, Vanarsdall RL. Orthodontics: Current Principles and Techniques. 3rd ed. St. Louis: Mosby; 2000.